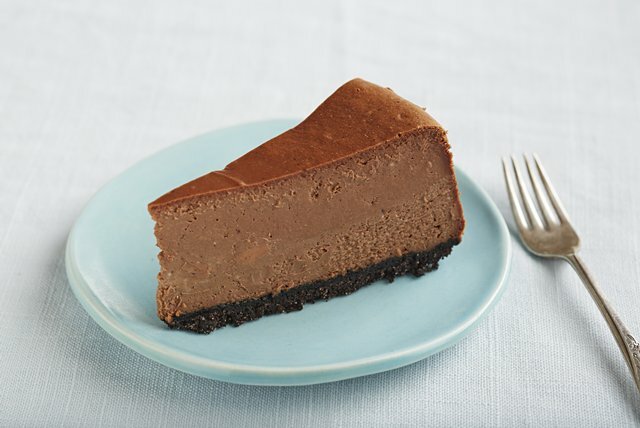 Melt chocolate in the batter of our PHILADELPHIA New York Chocolate Cheesecake! This New York Chocolate Cheesecake turns a classic into a decadent dessert. Preheat oven to 350°F if using a silver 9-inch springform pan (or to 325°F if using a dark nonstick 9-inch springform pan). Mix crumbs, 3 Tbsp. sugar and the butter; press firmly onto bottom of pan. Bake 10 min. Beat cream cheese, 1 cup sugar, the flour and vanilla in large bowl with electric mixer on medium speed until well blended. Add melted chocolate and sour cream; mix well. Add eggs, one at a time, mixing on low speed after each addition just until blended. Pour over crust. Bake 1 hour 5 min. to 1 hour 10 min. or until center is almost set. Run knife around rim of pan to loosen cake; cool before removing rim of pan. Refrigerate at least 4 hours or overnight. Store leftover cheesecake in refrigerator. You'll know it's an extra-special occasion when you get to enjoy a serving of this indulgent cheesecake. Makes 16 servings, one slice each.